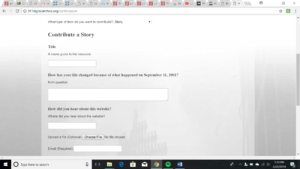 Launched shortly after the attacks, the 9/11 Digitial Archives uses electronic media to collect, preserve, and present the history of 9/11 and its aftermath. The archives contains over 150,000 digital items, such as emails, personal stories, and digital images. 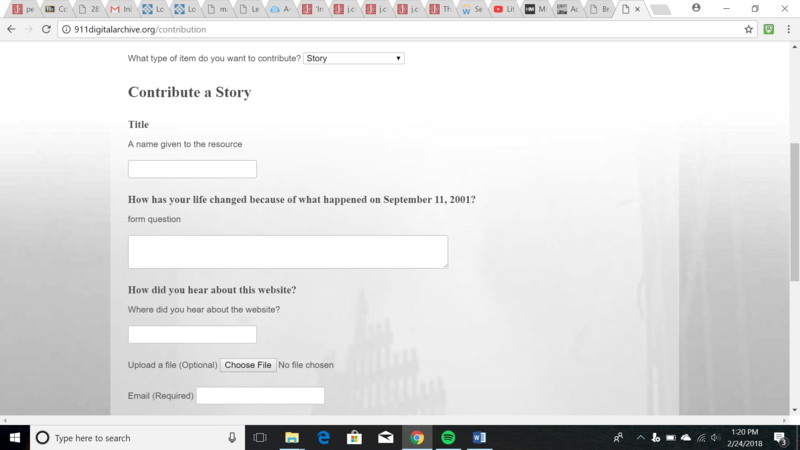 There is also a section of the archive with gathered links of additional resources the user can use in order to research more information about the attacks on 9/11. The 9/11 Digital Archives is also powered by Omeka which was cool to see since we learned about Omeka two weeks ago in class. 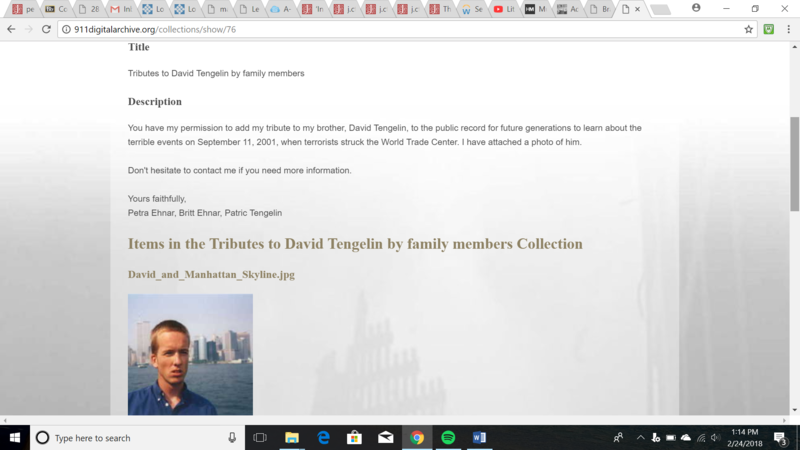 For someone, like me, who has never seen the 9/11 Digital Archives before, the website is very easy to navigate. 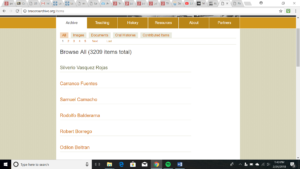 To search the collection, there is a collection tab that you can click and sends you to this screen, categorizing the digital collection into seperate sections, such as Audio, Personal Accounts, Photography, etc. When a user click on one of the boxes, for example on the photography box, the user is sent to a page with a description of what is categorized under photography and a collection tree with links for all of the digital photographs, usually organized by people or title, that the user can click on and browse through or download. One of the cool things about the 9/11 Digital Archives is that it is very easy for the average person to contribute their own content and personal stories to the archive. The user just clicks on the contribute tab and fills out the boxes of information. Any user can contribute their own personal story or audio, video, or digital images to the archives. 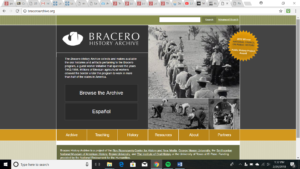 The Bracero History Archives collects and makes available the oral histories and artifacts pertaining to the Bracero program, a guest worker initiative that spanned the years 1942-1964 where millions of Mexican agricultural workers crossed the border to work in more than half of the states in America. Users of the digital archive have the option to browse through the collections in either English or Spanish, making the archive accessible to a wide audience. 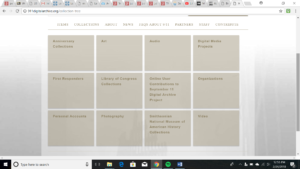 When the online user goes through the collection, they have the option to browse through the entire collection (3,209 items), or can browse through particular divisions of the collection: Images, Documents, Oral Histories, and Contributed Items. The collection items are not listed in any particular order, such as alphabetization, so unless the user has a specfic individual or item they are looking for that they can type in the search box, the user has to take more time to look through the collection to find what he or she may be looking for. The Bracero History Archives also offers users a selected bibliography if users are interested in researching the history of the Bracero program beyond the archives. The archives also offers resources for teachers to teach students about the Bracero program and also offers online tutorials on how to navigate the online archives for first time users. Compared to the 9/11 Digital Archives, I found it much harder to contribute my own personal items to the archives. Even though the Bracero History Archives offer another video tutorial on how to contribute digital items to the archive, I still couldn’t figure out where on the website I go to contribute the items myself. I also think the website has changed since these video tutorials were created, making it difficult to find out where I am supposed to go to contribute digital items to the archives. Kudos to the people who figured it out though, since there are many contributed items to the archives. Overall, I thought both digital archives were interesting and easy to use. I especially liked that both offered ways for ordinary users to contribute their own items to the digital archives. Do you prefer one digital archive over another? The Shelley-Godwin Archive is a prime example of the collaborative work that can become a “digital archive”. As is stated on the site’s Homepage, this archive is a digital collection of manuscripts from the Shelley-Godwin family. The layout of the site is not only accessible but extraordinarily educational. 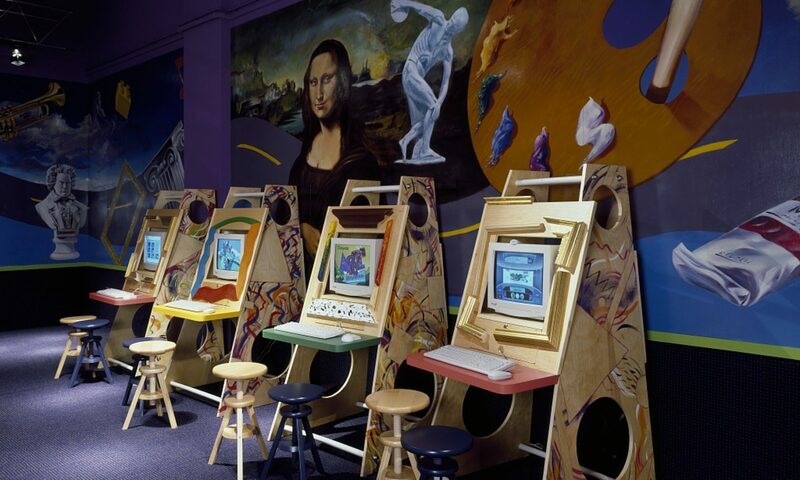 As the visitor scrolls through the site, they can learn not only about the history of this “talented” family of writers, but of the history of the digital archive itself. This is the perfect example of the type of collaborative work that was discussed during our week on digital projects. Not only did many scholars work on this archive, but there are a number of technologists and cultural heritage professionals that have contributed and continue to contribute to this work that made it a reality over the years. As I stated before, not only is the archive educational, but it is extremely user-friendly. There is a brief, introductory video that takes the visitor through the entire site, what its purpose is, and how it can be utilized. Not only that, but there are multiple subsequent videos that discuss specific aspects of using the site, including reading the manuscripts, using unique features, and accessing the material. The manuscripts of the Shelley-Godwin family have been transcribed within the archive and can be seen side-by-side with the actual manuscript page, allowing the reader to fully grasp the importance of the works while simultaneously understanding the importance of such a group of work. As stated in the Owens article, “What Do you Mean by Archive? Genres of Usage for Digital Preservers”, there are many ways in which to describe the word “archive”, and the Shelley-Godwin Archive is the perfect example of what defines a “digital archive”. The Rossetti Archive is another example of not only a digital archive, but a hypermedia archive, as referenced in the McGann article. As the article explains, it is more out of necessity that this was the case because of the nature of the Rossetti documents. In order to digitize certain computational images, one needs to take advantage of this hypertext and hypermedia. The Rossetti Archive is a seen as an extremely dedicated work, having been done in multiple installments, starting in 1993 until 2008. With Kirschenbaum’s “Done” article in mind, we see another example with the Rossetti archives of how these projects are never truly finished. The Rossetti Archive was continuing its projects with helping develop the NINES project. The NINES project is strengthening and expanding the use of digital tools within scholarship. 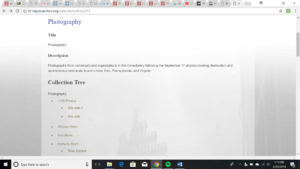 Relatively simple to navigate, the archive’s homepage tells the tale of the project itself, as well as the fact that the Rosetti archive “facilitates the scholarly study of Dante Gabriel Rossetti”. A long and collaborative project, this archive is not only informational, but relatively easy to use. Like the Shelley-Godwin archive, it has a search function with advanced options. A visitor to the site also has the ability to browse chronologically through Rossetti’s works. The Rossetti Archive is really an impressive picture of the “respect des fondes” discussed in Jefferson Bailey’s article, “Disrespect des Fondes”, and is indicative of how and where the digital field of history, archives, and scholarship are moving. Minoru Masuda, Hana Masuda, Masayo Duus. Each of these names belong to American citizens who, because of their race, suffered discrimination at the hands of the government as well as at the hands of their neighbors during World War II. During World War II the United States government pursued policies of relocation and internment of American citizens and residents of Japanese descent. Their stories are not all the same however. While some were sent to internment camps, others volunteered for military service and ended up on the front lines in Europe. The experiences of Japanese-Americans before, during, and immediately after World War II vary significantly based on age, location, and citizenship status. This project aims to provide valuable insight into these experiences beyond the average American’s understanding that Japanese-Americans were interned during the war. For my project I will create a map that shows the journey of a number of Japanese-Americans, whether born in the United States or in Japan, as they were interned, relocated, deployed, and eventually attempted to return “home” once the war was over. Google My Maps is a perfect fit for my project. With My Maps I am able to plot every significant location that each person passed through or spent time in. I can use the tools that My Maps provides to mark each location according to who was there and through a variety of customizable tools I can attach easily recognizable symbols to each, allowing interested audience members to focus on specific aspects of the journeys or on the stories of specific people. This project will visualize the experiences of people whose stories have been covered copiously through text. As relocation and movement is central to their stories however, this project will provide a more easily accessible medium by which audiences can understand and interpret the Japanese-American experience. Through My Maps I am also able to append images and links to each location, building a more holistic understanding of the material. Rather than flipping back and forth between pages to find an image that corresponds to an anecdote about a place through My Maps I will be able to include images, videos, and even audio clips that can more readily convey the immense emotion integral to these stories. The informative textual element will not be lost however, each element; textual, audio, and visual will tie into one another. Part of the reason that I am using My Maps for the project is that it is accessible to anyone with access to Google Maps. This means that I can reach a wide audience through various social media platforms. 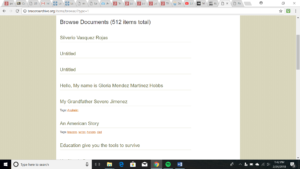 This project is aimed to reach non-academic audiences and connect them directly to stories that are often overlooked in American history. I can evaluate the success of my project through the use of Google Analytics which can monitor interaction with my map. Google Analytics will tell me important information such as how long people spend viewing my map and which stories they interact with.